Pumpkins stretch out forever, as do copies of ourselves. Yayoi Kusama wowed us with her 2012 exhibition at Tate Modern, and now she's back in London, with a show that's just as ambitious — and just as dotty. The eponymous show is housed across the two Victoria Miro spaces; some works are in the Mayfair one but it's the Wharf Road gallery where the meaty action is — spanning three floors and even spilling out into the garden. 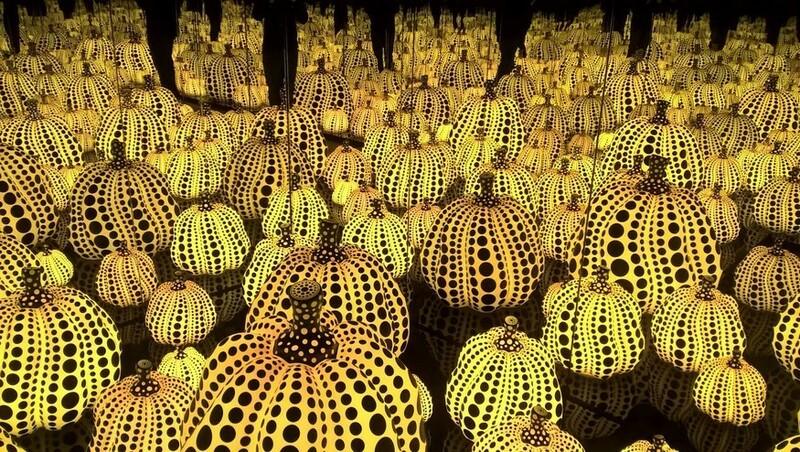 As expected, we get Kusama's trademark bold and bright dot patterns on paintings and her pumpkin sculptures — but it's the three infinity rooms which are the real treat. Here, mirrored walls create the illusion of one item being multiplied over and over — seemingly stretched out into infinity. It's a weird and wonderful experience to be stood in a room and seeing multiple versions of yourself all looking at the same chandelier from different angles. If ever there was an artwork made for taking a selfie, this is it. As for a room full of those yellow and black pumpkins — it's sensational, and won't fail to bring a smile to the sourest of mushes. It's hard not to get swept up in the joyous nature of Kusama's work. Comparisons will inevitably be drawn with her Tate show, and while this isn't at that level, you'd still be dotty to miss it. Yayoi Kusama is on at Victoria Miro, 16 Wharf Road, N1 7RW & 14 St. George street, W1s 1FE until 30 July. Entrance is free and both exhibitions are open Tuesday to Saturday. For more art see our most talked about exhibitions.